We’re entering the era of the bendy wearable smartphone – with new patents from Samsung, a new product in the form of the Nubia Alpha and the whole world of tech getting flexible. Seeing the tech world get into a frenzy over the Nubia Alpha in Barcelona felt a little like déjà vu. We'd seen it all before – back in 2014 – with the Samsung Gear S.
What's more, Samsung itself has just acquired the patent for a wearable smartphone that bends – using the same technology as flexible smartphones being touted by the likes of its new smartphone, and similar devices from LG and Huawei. But as we prepare to enter this new era of bendy super-wearables, it’s worth taking a look back at the Gear S – a device that lived short in the memory, but might have just earned its significance half a decade on. Launched back in 2014, the Gear S is the natural ancestor of the current crop of bendy smartphone wearables. With its large curved 2-inch display, eye-popping 360 x 480 display, and ability to make calls with its own SIM capability – three years before Apple would come out with the Series 3 LTE – it was a smartwatch way ahead of its time. But the Gear S was merely a blip in the smartwatch world, launching as it did nearly head to head with the original Apple Watch. We never saw one in the wild although it was heavily mentioned in the Wareable comments section, mostly by a couple of users that had forked out $350 for the privilege of owning one. The design was more a digital cuff than a watch, with a wraparound display that revealed a full-qwerty keyboard to type out messages on. The curved OLED technology that the Samsung Gear S was born out of was the natural predecessor to today’s bendy tech – although the thing was as rigid as a leg iron. It was a signal for Samsung’s future strategy as well. 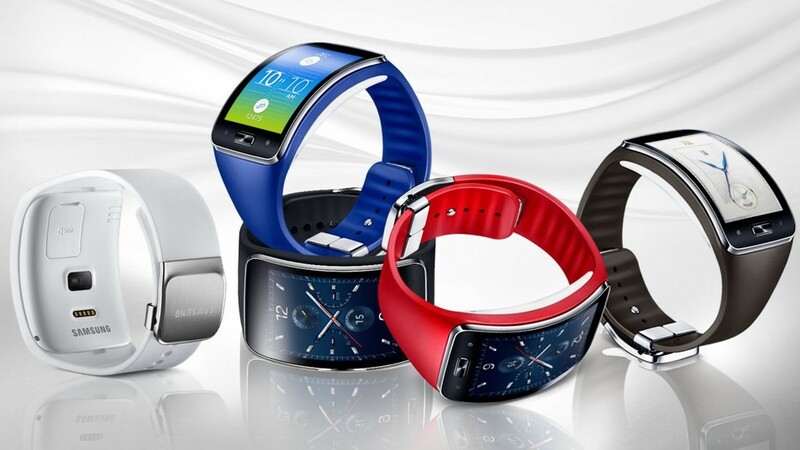 Like 2013’s Galaxy Gear – itself worthy of a revisit – the Gear S ran Tizen, putting to bed Samsung’s brief flirtation with Android Wear on the Samsung Gear Live. But what can today’s wearable smartphones learn from the Samsung Gear S? Well, as uncomfortable as the Nubia Alpha was to wear in our hands-on review, the Samsung Gear S wasn’t actually that bad. In fact, we praised it for its comfort, which seems surprising looking back at the photos. Though you can't say that it oozed wearability – it looks absurd. Our complaints around the Samsung Gear S were chiefly about usability, and this is still the challenge for 2019’s devices. While you can make the display as bendy and as large as you like, it still has to work as a wearable – and the duality of its form factor will only make that more difficult. “Instead, it’s a mishmash of impressive features combined with a fiddly user experience that won’t really appeal to anyone. Its limitations and annoyances could have been more easily forgiven if it wasn’t so bloomin’ expensive. $349?! Get real Samsung," editor Paul Lamkin wrote at the time. While looking back shows that the rise of the Apple Watch has led us to accept higher prices generally (both that and the Samsung Galaxy Watch retail for similar, if not higher prices), it was usability that made the Gear S a real non-starter. The second problem with the Samsung Gear S was its target market. Who wanted such a large wearable – with two contracted devices: a smartphone and a watch? Technology has solved many of these questions in the interim period, and eSIM tech has eliminated the need to have two cell numbers, and normalised wearable-based communication. But the idea of a wearable smartphone raises new issues. With such unwieldy designs – who are they aimed at? And who would want one? In a way, these are the questions the Samsung Gear S asked. And while the Gear S flopped, those questions were answered – and we have the likes of the Apple Watch Series 4 LTE, Samsung’s own Galaxy Watch in response. And while today’s wearable smartphones may not be the answer, they too have their own questions to deal with.